In my previous article on how to date your Seiko watch, I mentioned the nifty Jayhawk’s Production Date Calculator. In most cases it should return the correct date of manufacture. However, there are circumstances in which the calculator may give you inconclusive or erroneous results. Or no results at all. When that happens, I would resort to what I call “dead reckoning” or rough estimation. Manually estimating the production date of a Seiko involves the element of anachronism. What is anachronism? Basically, it is the utilization of an event, a person, an object, language in a time when that event, person or object was not in existence. In other words, an anachronism is something that occurs out of its proper time. The chronological error of an anachronism can occur in either direction; it can result from something from the past being represented as if it belonged in the present, like an archaism, or it can result from presenting something at a time before it actually appeared, occurred, or existed. And anachronism is the key to manually estimating the production date of your Seiko watch. An example would be saying that a digital LCD watch was produced back in 1964 or claiming that old Kinetic watch in your drawer was purchased in 1983. 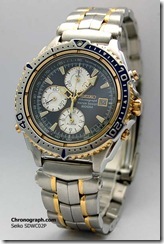 Or an eBay seller proclaiming a vintage Seiko 7T59 quartz chronograph as a brand new model from 2003. In actuality, digital watches were only commercially available in the middle of the 1970s. Seiko Kinetics, originally branded as “Auto Quartz” and “A.G.S” (Automatic Generation System) only appeared at the end of the 1980s. As for the prized and short-lived, rare 7T59 chronograph models, they were only made between 1991 and 1993. Putting it in another way, it’s like saying the iPhone was already available in the 1990s or Microsoft Windows 7 users were running the operating system in 2004 (neither are true!). Eagle eyed movie buffs are quick to point out anachronisms in movies and you can read about them under the “Goofs” section for the movie title in the Internet Movie Database. OK, now that you basically know what an anachronism is, let’s learn how to date your Seiko watch manually! Knowing when the caliber was first made and ended production would the first useful clue. A very straightforward example is the 7002 automatic diver which was introduced in 1988 to replace the aging 6309 model whose production years ran from 1976 to 1988. The 7002 had a market life span of eight years and was shelved by mid 1996 (replaced by the current 7s26 caliber). Therefore all 7002s couldn’t be made earlier than 1988 nor later than 1996. Another good instance would be the famous 6138 and 6139 automatic chronographs. Seiko introduced these robust and workhorse calibers in 1970 and 1969 respectively. 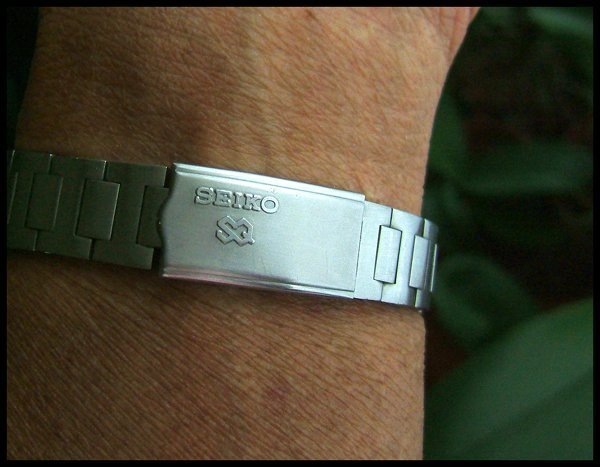 Neither calibers never made it to 1980 and to my best knowledge, Seiko ceased making 6139s between 1978 and 1979. Why were they discontinued? My guess is these calibers were getting more costly to manufacture and at the same time, Seiko wanted to push its quartz technology to the watch buying public. Maybe at the time they thought that mechanical chronographs were obsolete and quartz was the way to go. The discontinuation of the 6138 and 6139 movements also unfortunately spelt the death of affordable Seiko automatic chronographs, much to the disappointment to Seiko mechanical watch fans. Currently, Seiko only offers automatic chronographs for its higher end lineups, such as the Brightz (caliber 6s28), Prospex Flightmaster (caliber 6s37) and the “Rolls Royce of Seikos” – the magnificent Seiko Credor (caliber 6s37). An early 6138-0011 from Oct 1970 (left) and a late production 6138-0011 dating to Apr 1977 (right). Note the “waterproof” marking on the earlier watch’s caseback and “water resistant” on the other one. Complications in dating a Seiko watch will arise when production of the caliber hits 10 years or longer. Generally, Seiko doesn’t continue making the same caliber for longer than 8 years unless the caliber itself is profitable to manufacture or it came up with a replacement caliber. Take for example, the 7T32 alarm chronograph. It first debuted in 1988 and was discontinued sometime in 2002. Therefore, if the a 7T32’s serial number starts with “1N”, you could narrow it down between 1988 and 2002. It cannot be 1981 because this caliber wasn’t available yet! Neither can it be 2008 because the caliber was already discontinued six years earlier. This unfortunately leaves you with two possibilities – either November 1991 or November 2001. Obviously, this is not going to be very helpful because the correct year of production has to be either one of them but not both! Try to enter the caliber and the serial number into the Production Date Calculator and it will assume that the watch is from November 1991. So how do you determine which is the correct production year? We take a step further by knowing the chronology of the watch’s reference number. When faced with the above dilemma, the next logical choice would be to know the chronological order of the model. This is not easy to tell unless you have seen photos of models of the same caliber to serve as reference. Early Seiko 7T32s have reference numbers beginning with “SDW” and followed by three digits while the last 7T32 models ended with “SDWG” with two trailing digits. The digits start from the lowest order to the highest order. When Seiko runs out of reference numbers, they would append a new alphabet starting with the letter “A”. In this example, a 7T32 model with the reference prefix “SDW” obviously predates one with a “SDWA” prefix. In the same manner, a model that has the prefix “SDWF” would be a much later model than a “SDWB” and so on. If you are able to determine that your mystery watch has a reference prefix e.g., “SDWF”, you can be sure that your watch is a late model 7T32. Therefore your watch would be a November 2001 production and not from 1991. The same model numbering convention holds true for other Seiko models. When the company dropped the 7T32 caliber in the early 2000s and replaced it with the 7T62, it designated the first batch of 7T62s as the SNA-series. 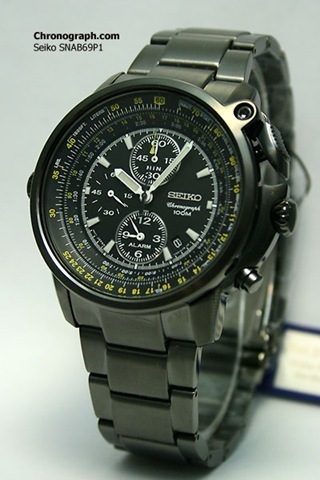 As mentioned earlier, Seiko assigns a running prefix number for its new models until it runs out of numbers. Thereafter, it would append an additional character into the reference prefix, starting with the alphabet “A”, as in “SNAA”. Six years have passed since first SNA models rolled out the factory assembly lines and at the time of writing, the most recent models have the “SNAB” prefix. In a few months from now, you’ll find 7T62 models with reference letters starting with “SNAC” and perhaps, “SNAD”. This will continue until Seiko decides to discontinue the 7T62 caliber and replace it with a new one. Its replacement caliber will of course, have different reference letters. When the watch’s reference number is unknown, there are certain visible clues that can help you zero in the watch’s production year. The key is in the watch markings. For instance, in the 70s and 80s Seiko typically uses the word “Seiko Quartz” or “SQ” to denote that the watch is a quartz powered model. The 80s was particularly Seiko’s golden age for their analog quartz models. In fact, the Japanese watch giant was capitalizing on its solid reputation as the world’s largest producer of analog quartz timepieces. The words “Quartz” and “SQ” also served as a selling point and differentiated their quartz models from their automatic counterparts. By the mid 1990s, Seiko had already carved itself a solid reputation as a quartz watch manufacturer. Seiko was churning out more quartz timepieces than mechanical ones and to the masses, a Seiko watch is generally associated with a quartz movement. 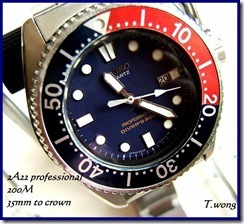 A beautiful and rare 2A22-026A Professional Diver’s 200m. The “Quartz” and “SQ” markings on the dial and bracelet clasp respectively are visible clues that this watch was from the mid 80s, Pictures courtesy of Thian Wong. Seiko probably felt they longer needed to mark their quartz products with the words “Quartz” and “SQ” so both labels were eventually dropped. 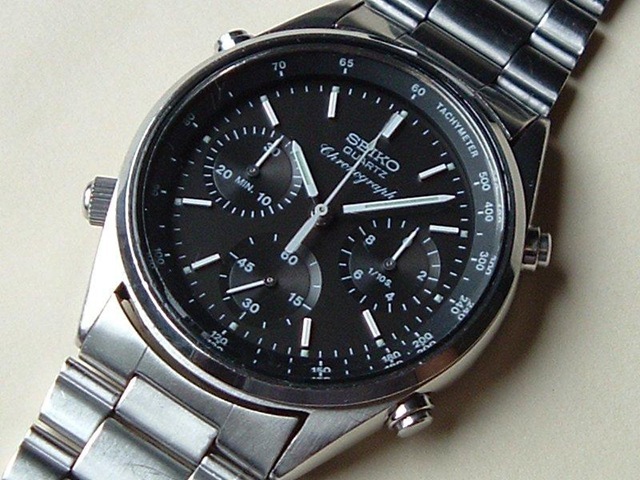 Since the mid 1990s, all Seiko watches are generally quartz by default. There are also some exceptions to this rule. 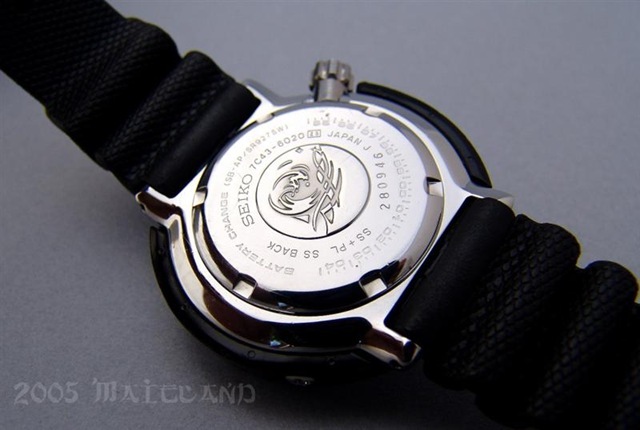 For instance, the SHC015P and SHC033P divers are still marked as “Seiko Quartz” for certain export markets. I presume the Seiko company did this to distinguish them from their 7s26 automatic divers as both models have strong resemblances to their automatic counterparts. 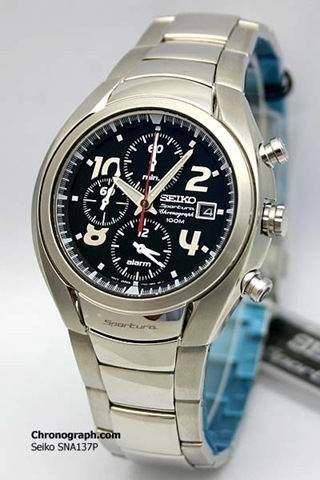 Currently, all Seiko watches are quartz models except if the movement type is indicated on the dial. Therefore, if the dial doesn’t say “Automatic”, “Kinetic”, “Thermic”, “Solar”, “Direct Drive” or “Spring Drive” then you can be sure that the watch is battery-powered quartz. This applies to all current Seikos, from their most affordable generic quartz watches to the high end Grand Seikos. Some vintage quartz divers come with battery change year markings on their casebacks. If the watch caliber’s battery life is rated for five years, there should be an indentation mark to indicate the approximate next battery change. This information can be very useful in getting the watch’s production year right. 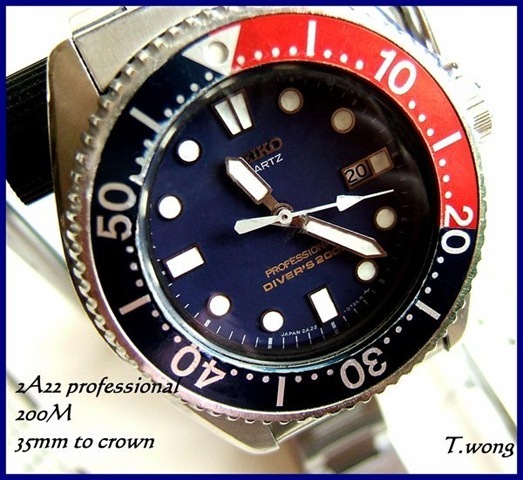 The photo below shows a vintage 7C43-6020 Professional Diver’s 200m. You can see the battery change markings on the caseback ranging from 1995 to 2004. The dimple mark is stamped on the year “95” as the 7C43’s battery life averages 3 years. An equally gorgeous and rare Japan market, Professional 200m diver’s watch made in 1992. Photo courtesy of Ty Maitland. As with fashion, hairstyles, music and popular culture, watches also undergo design trends and fads. Getting the production year right purely based on the watch design is not that easy but you can still make educated guesses if you know a thing or two about design elements in its time. For instance, LCD watches were the craze in the mid 1970s and Seiko produced pretty good classic LCD timepieces during the era. Therefore if you have Seiko watches looking like in this picture below, there’s the element of certainty that they were from the late 1970s to the early 80s and no later than that. A trio of well preserved Seiko LC digitals from the 70s. Seiko gradually phased out LCD watches with metal cases and bracelets by the mid 1980s. Throughout the 1980s, Seiko made quite a number of analog-digital quartz calibers. The analog-digital trend unfortunately also faded by the early 1990s in favor of full analog quartz designs. Currently Seiko has only two analog-digital calibers left in its stable – the world-time H023, which is nearing its end of production life and also its latest H024 caliber. 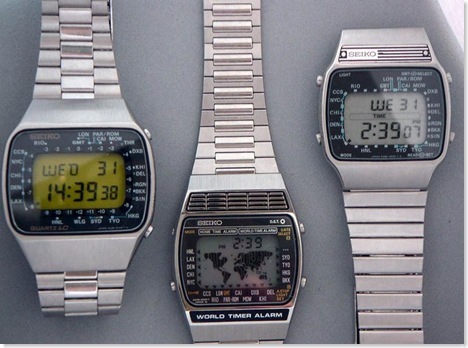 If your watches look like these, you can be sure that they were from the 1980s. A memorable example is the “moonphase” display trend on watches in the late 1980s. Practically almost all manufacturers (even the Guess fashion brand) had moonphase dial watches back then. The moonphase fad had died down by the late 90s and to my best knowledge, currently only Citizen has moonphase models in their upmarket quartz and Eco-Drive Campanola line and of course, a handful of fine Swiss mechanical watches. Two examples of forgotten moonphase Seikos from the early 1990s – a 7F39 (left) and a 7A48 (right). Seiko no longer made moonphase quartz watches since then. As Seiko has made countless models since the last century, it is not possible to detail every possible style in this article. However you can at least scope the production year within one decade if you’re familiar with the watch styling. 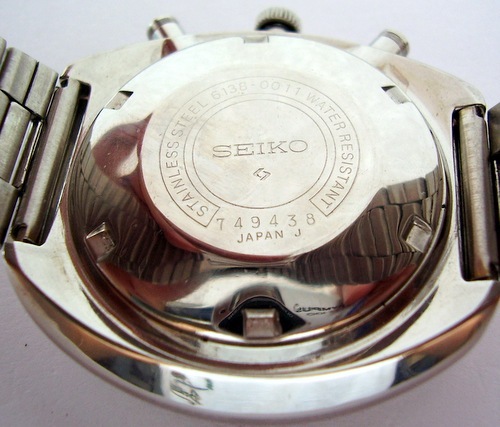 A watch marked as “Seikosha” instead of Seiko is likely to made in the early 1960s or earlier. 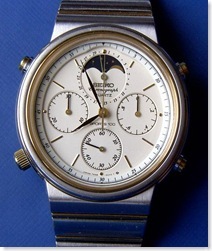 A Seiko that has a 7-digit serial number is likely to be made in 1968 or earlier. A Seiko that’s marked as “waterproof” is likely to be made before mid 1971. A Seiko that uses Promethium-147 or Tritium radioactive luminous compound (instead of the non-radioactive LumiBrite) is likely to be made before the mid 1990s. 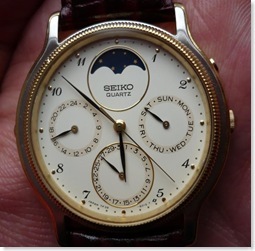 A Kinetic Seiko that’s labeled as “AGS” or “Auto Quartz” is likely to be from 1996 or earlier. A Seiko 5 with a solid stainless steel caseback (as opposed to glass display back) is likely to be made well before 2004. Some Seiko 7s26 divers, like the SKX011K were introduced earlier but were later dropped from the market and replaced with the SKX011J. In most likelihood, an SKX011K predates the SKX011J version. Although estimating the production year of a Seiko watch could be done by looking for signs of aging, wear and tear, this is a very subjective and by no means a foolproof method for determining its age. Generally, a ten year old watch or older would show telltale signs of its age in the form of case scuffs, dents, scratches on the glass and bracelet, non-working functions, faded dials, rusty watch hands, casebacks, etc. On the other hand, a relatively new watch could also accumulate those scratches, dents and cosmetic flaws, depending on the manner the previous owner wore his timepiece. One way is to judge the condition of the dial. Watches that have lived a long rough life have a tendency to have faded dials and bezels, especially if the dial has been exposed to the sun daily for years. It’s not just the heat but the sun’s ultraviolet (UV) rays that will cause dial fading. Here’s an example of an old SKX025J that predates the SKX025K that is sold today. The watch is non-functional and the eBay sellers sold this as a parts watch. An early model Japan-made, SKX025J mid-sized diver. This watch was probably made between 1996 and 2001. Manually tracing the production year of a Seiko watch can be very tricky at best. If you have a relatively little known caliber or model you may be forced to resort to estimating by the watch design and text markings. Thank you for you help. Did the markings I mentioned tally with an original watch. Also the slight play of the bezel across the face it actually click when I move it. Is that normal. Lastly how long approx. would a SKX013 run after wearing for a day? I was away on a trip to Borneo at the time you sent in your question and I apologize for the belated reply. The 2620 is a quartz caliber from the late 1970s, but I’m not sure how long Seiko made the caliber before it was discontinued. It’s a simple gents’ watch with 2 jewels and no day/date calendar. I’m inclined to think that your watch was made on August 1978. It was fully Japan made by Seiko’s Daini factory. I’m sorry I can’t provide you with its history as it was considered one of the generic Seiko quartz watches in its time, nothing really significant about it. Thank you so very much for the info on the Seiko 5126. I don’t know how you find the time to provide so much detail to so many people but I’m so glad you do. I’m surprised to learn the watch could be valued at up to USD250 and glad I don’t have to worry about wearing it or insure it but really, this watch is priceless to me because of the connection to my wife’s dad. I will continue to wear it and pass it down to my son. Thank you again and I hope you enjoyed your vacation in Borneo! You’re welcome.  There are very few surviving 5126 watches today compared to other calibers of its era and I didn’t know about its existence until I found that Seiko 5 Sports 5126-6010, which cost me less than two hundred dollars (US). You can’t put a price to sentimental value, therefore it would be a good idea to have your watch serviced, if you haven’t done so. The rubber gaskets would have become brittle by now and the original lubricants could have gelled up over such a long time. Have its accuracy checked and the movement regulated for accurate timekeeping too. Seiko’s old calibers are really robust and long lasting. I’ve had two 7s26 Seiko 5s fail on me despite careful wearing, but none of my vintage Seiko watches have let me down so far. I know from your posts that it was made in August of the ninth year of some decade, and was #2581 of that month. I can’t find any watches like it through all of my online searching, and am hoping you can shed some light on it’s story. Thank you in advance! I cannot tell when your watch was made because you did not give the important caliber/caseback codes, which are found at the back of the watch. Can you help with info on a Seiko I got?Age,value,collectibility,etc. I paid very little but watch is only in fair condition,dirty,and didn’t run.Now after removing back cover and cleaning, everything works and it keeps perfect time. Square, gents,dress watch,steel adjustible band (SQ on clasp). Analog face; second hand; day(English-French)-date @3o’clock; SQ on face@6o’clock;no #s on face only slashes. Back:water resistant stainless steel 8123-5129 AO inside a square box 330999. Inside:adjusted five jewels Seiko Time Corp. Japan A lightning bolts. On face underwhere 6 would be: 8123-5140T and lightning bolts. Any info would be greatly appreciated. Thanks!! I sincerely apologize for the belated response due to unavoidable health circumstances. I don’t think there were any counterfeit 7009 caliber Seiko 5s in its time, because there’s no record of anyone having one and describing one in watch forums. However, if you are able to take clear pictures of your watch (front and back) and upload them to the TinyPic image sharing site and reply to this comment with the link to your images, only then I can ascertain if your watch is truly genuine. Right now all I can tell you is that your watch could have been made on Sept 1991. Seiko used the 7009 extensively for its low end models (including the Seiko 5) until 1996, when it was replaced by the 7s26 caliber that’s still being used to this day. As many have said earlier, this is indeed a valuable and hard worked resource on Seiko and relevant stuff, amongst other. 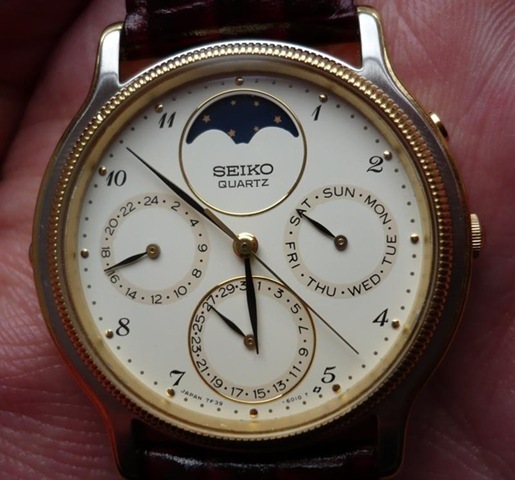 However I was wondering, if we are to date our Seiko’s the way you tell us to, how can we do it for quartz watches as there is no resource for that on the web which contains complete list of quartz movements production start and stop dates, can you help us out and create such a list from your extensive experience? Secondly, are Seiko movements only are used in Alba watches or there are some Alba’s own movements too? And can we date Alba watches the same way we can date Seiko’s as you have taught? 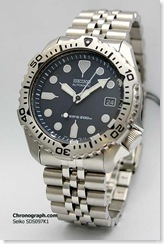 Lastly, I have a titanium scuba 200m water resist date Seiko which I believe was a Japan only model, can you provide approx. production date for it? My dilemma started when I acquired a Seiko ladies watch from my mother. I don’t know how long she’s had it but she gave it to me to have it appraised. None of the places I went to gave me concrete answers because they don’t know much about vintage seiko watches. I would like to describe it to the best of my ability: Its gold toned with stainless steel back, has a small quartz or diamond in the 12’o clock(not sure), no numbers in front, only small lines, no seconds only hour and minutes hand, and the serial # is 950790, 4N00-5060 with the letters RO inside a box frame next to these numbers. Its in xcellent condition but i don’t know to turn it on because i fear that i might break it. Should I hold on to it because it’s rare or unique? or i can sell it but i don’t know its value. My Mom tells me to research about it before i make drastic and impulsive decisions. PLEASE HELP, QUARTZIMODO AND SEIKO SEEKERS!! Hi – The Online form doesn’t appear to work at the moment. 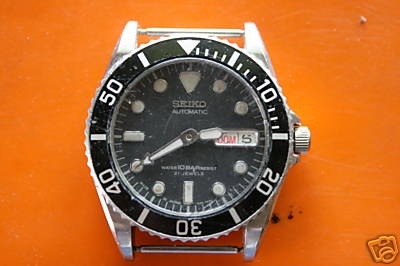 I have a Seiko 5 Sport Speed Timer (SN 290419) that I’d like to part with (Trade or Sell) in order to aquire more Seiko’s. I’m very new to the watch forums. Suggestions to it’s fair value would be greatly appreciated. I have dealt online with a lot of Muical instruments – but I imagine, there is a much more deliate protocal with watches. 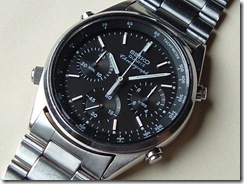 Thanks for dropping by my blog and raising the question about your Seiko 5 Speedtimer. With only the serial numbers to go with, nobody knows the model that you own because Seiko made several models bearing the Speedtimer name from different calibers. In fact, I myself own a few Speedtimer models from the 6139 and 6138 chronograph families. You need to know the caliber/caseback details that are found at the back of your watch first. Saying that you have a Seiko 5 Speedtimer for sale is like having a Fender Stratocaster for sale, giving only the serial numbers in the advertisement. What year is the guitar from? Is it a pre-CBS or post-CBS model? Does the guitar happen to be the short-lived, “The Strat” from the early 80s? Is it a vintage 1954 reproduction or a Mexico made Stratocaster with a Floyd Rose tremolo and humbuckers? Rosewood or Maple fingerboard? Active or passive electronics? It’s the same when it comes to Seiko watches. You need to be more elaborate in your description. Hello, I have a Lassale 5Y30-5K69 RO 060242 I purchaced it new back in the late 80s or early 90s for around $300 and was trying to find out what it would be worth today. Thank you for the question. You can try to find out the value of your Lassale watch by searching for it on eBay. Because the Lassale series watches come in several caliber/movement types and differing metals (most are 18K gold; others in stainless steel) and in various conditions, it’s hard to say how much yours is worth now. All I can tell you is that your Lassale was most probably made on June 1990. You have one of those stylish, asymmetrical cased Seiko Kinetic sports watches. The model code for your watch is SKA187P and was been made on August 2002. Seiko does not list your model on its official websites as the company makes too many models for them to list. They are not willing to go through the trouble of listing archived or discontinued models on their websites; so what you see on Seiko’s websites are generally the currently selling models. I have a 7N43-9048 with a serial# of 860254. I know nothing about it, it was a cheap 10 dollar garage sale buy. Any information on it would be great. I have a SEIKO 5 KY 7009-3170 with serial nr 009613 can you tell me from which year is it? and i would like to know what does A2 mean after the model nr. Thank you in advance. I have a man’s Seiko Quartz watch with white face and numbers not nurmals. It also has no date. Here is the information on back. I would like to know approx date of it if possible. Or anything you might know about it. The V700-8A10 is a simple gent’s quartz dress watch on a leather strap. This watch has a Japan made movement but was assembled in Hong Kong (China). It requires a Seiko or Maxell SR616SW 1.55 volt battery which will run the watch for approximately 3 years. There’s nothing of historical significance behind this model; it’s one of the countless quartz dress models which Seiko made in the past. As such, it has little value to it and pre-owned ones usually sell between USD50-70. Your watch was likely to be made on April 1995. Hi. I have a Seiko Bell-Matic with Serial Number 300772 and is 4006-6021. May I know when it was manufactured. Thanks! Hi , enjoying reading ur blog. I have a seiko 5 with serial number 2N3639 and case number 7s26 0440 , accorind to ur previous artical i can tell it was manufactured on Nov 2002 (correct me if i am wrong) . I just curious about where was the movement assembled ? Thanks in advance . Your Seiko watch carries the reference prefix SNXxxxK of which the lowercase “x” refers to digits, e.g. SNX113K, SNX115K, SNX551K, etc depending on the actual model. 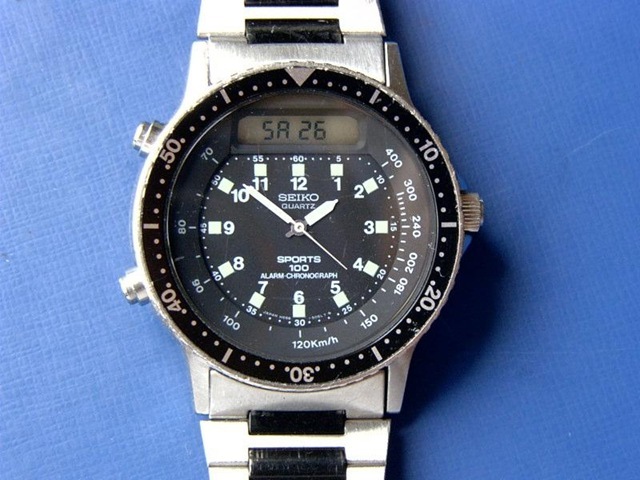 Early SNX Seiko 5s had a stainless steel caseback instead of the see-thru display back. As such, November 2002 is very likely to be its production month and year. Basic Seiko 5 watches with the 7s26 automatic caliber have their movements made in Singapore (7s26A), while 7s26B and 7s26C versions are assembled in Malaysia. Regardless of the movement, Seiko 5 watches are cased in Hong Kong except for certain models that are purported to be wholly assembled in Japan. Hello. Please excuse this question regarding a watch I bought for my son. It is a Pulsar, so I hope you can find the time to help. I bought a PF3291. It is an analog chronograph with a 12 hour alarm. I have tried repeatedly to set the alarm but it never sounds. The alarm seems to function solely as a regular watch. I bought the watch on eBay and if I mail it back for a refund I am required to pay for shipping and a 10% restocking fee. I’m not familiar with individual Pulsar watches as this brand is marketed exclusively in the U.S. However, I managed to track down the model PF3291 and found out that it uses the Seiko 7T62 alarm chronograph movement. The 7T62’s alarm subdial has its own timekeeping and it can operate separately from the watch’s main time. I own a Seiko watch with the 7T62 caliber and I found that it’s tricky to set the alarm compared to its predecessor, the well loved 7T32 caliber. Instructions on how to set the your Pulsar’s alarm can be found here. You can only determine the movement version by opening up the caseback and looking at the watch’s oscillating weight. Seiko 5 models made from 2004 onwards have a see-through, glass display back and you can view the oscillating weight. A 7s26A movement would have “7S26A” and “Seiko Time Corp” engraved on the weight. As far as I know, all 7s26A movements are Singapore made (1996-2006), while 7s26B and 7s26C variants are assembled in Malaysia. Since your watch is from 2002, it would have a Singapore assembled movement. Hey there, I really like that you’re doing these articles. I’m having real difficulty with determining the age of my Seiko.. I believe this watch to be AT LEAST 20 years old, so my best guess so far is that it is from August 1982. The ‘0089’ suggests to me that it is a very early unit in the series. It has no markings for gold karat, but I would love to find this out, so that I can have a rough idea of what this may be worth as gold. Thanks for compliments! You got the manufacturing date correct, as the H601 (“H” stands for Hybrid analog/digital display) caliber was from the early 80s. “0089” means that your watch was the 90th piece that was made on Feb 1982 for this model. The first watch off the production line will always be stamped “0000” while the second piece gets the number “0001” and the 10,000th watch would have “9999” stamped (although I’ve never seen such an example); therefore you’ll have to add one to the last four digits. Your watch is not made of solid gold, period. Seiko real gold watches would have “18K GOLD” stamped on its caseback; and if it has a gold plated case you would see “SGP” (Seiko Gold Plated) marked. On the other hand, a Seiko watch having a gold-colored dial, hands or dial markers but has a stainless steel case, will have “ST. STEEL” or “ST. STEEL BACK” marked on its caseback, like on your watch. 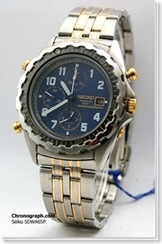 As for its value, square cased H601 watches fetch about USD150 or less on eBay, depending on its condition. Here’s an example of a full luminous dial, H601. Based on your article, this should have been manufactured Sept of 1984, right? 1. Why is the marking on the face different from the marking at the back as to the digits following 6309? The marking in front or in the face says 6309-820N TH. Is this a fake SEIKO 5? 2. would it be possible to know from any of the markings on the watch if the watch was made in Japan, HK or anywhere else? Thank you so much for your very informative article. Thanks for the interesting question. I duly apologize for the late reply as I’ve been away for sometime and I hope you’ll bear with me. OK, let’s cut to the chase. Firstly, your date estimation is correct; your 6309 was indeed from September 1984. 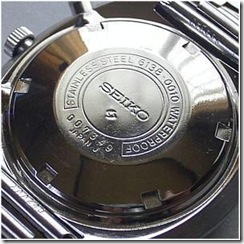 Seiko marks the front dial and caseback codes differently for a reason. In most cases, several designs are available based on a common caliber/caseback type. By “design”, I’m referring to the dial color and style. So you can find a dozen different 6309-8840s, but each model has its unique dial code to signify the dial design/color. Having a common denominator (the caseback code) simplifies things for Seiko, in addition to cost savings by not having the caseback engraved with the exact dial code for every single variation made. 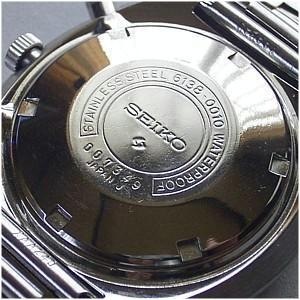 Seiko collectors usually use the rear caseback code to denote a particular model and not by the dial code, which is the “6309-820N” that you see on the dial. That is why the two identities don’t match. All other features of the watch are the same; the crystal, crown, hands, case and bracelet. I don’t think there were ever fake 6309s during the era the 6309 caliber watches were made. Since you inherited the Seiko 5 6309-8840 from your grandfather, you can safely assume that it’s all-original. 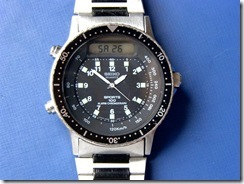 The 6309 debuted in 1977 and earlier batches were assembled in Japan by Seiko’s Suwa factory. By the mid 1980s, Seiko shifted the production of their 6309 models to Hong Kong (China). While the movement and parts were sourced from Japan, the encasement or final assembly was done in Hong Kong in order to save on production costs. How to tell if your watch was Hong Kong assembled? The absence of the word “JAPAN 6309” on the front dial. Watches that were assembled by Seiko Japan will have “JAPAN” on the dial and “JAPAN” on the caseback. Take note that only US export models will have the exact country of manufacture and assembly printed on the dial as per the U.S. Federal Trade Commission’s import labeling laws. I’ve seen examples of Seiko 7002-7009 divers bearing “Mov’t Singapore Dial Japan Cased Hong Kong” (all in uppercase letters) printed on the dial, while “Mov’t Singapore” is engraved on the caseback. Since your watch is a non-US version, Seiko simply leaves out the country of manufacture from the dial and caseback, presumably to give the dial an uncluttered look. I would like to inquire about information and specs regarding a SEIKO watch I have. My wife purchased for me around 1993-1995? The dial is all white with 4 dials: alarm, stopwatch, date, and seconds. “MOVEMENT JAPAN”(left) and “7T34” (right) of the digit. I am pretty sure the date is going to be April of 1994. What I am curious about is not reading much of the 7t34s unless they were standard run-of-mill movements. Just not sure what to make of it. I solicit your expertise and know you are the expert. Thanks for submitting this interesting question and I apologize for replying late. I don’t get too many queries regarding the rarer 7T34, which is a sibling to the more common 7T32 alarm-chronograph. April 1994 is indeed, the correct production date for the 7T34. It appeared about the same time as the 7T32 and was simultaneously discontinued together by 2002. 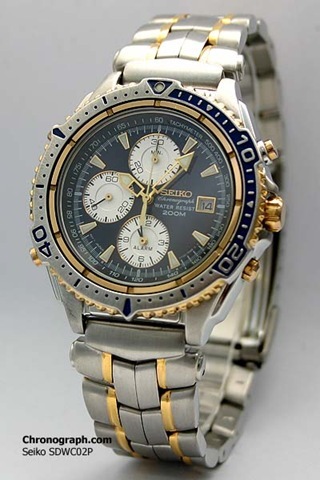 One of the last models was the SEH095P that was sold only in Southeast Asia under the Seiko Criteria sub-brand. The sole difference between the two is the circular calendar sub-dial instead of the more conventional digital date in a window on the dial. All 7T34 models were given the prefix “SEH”, which differentiates it from the 7T32’s “SDW”. The reason you don’t see too many 7T34’s made was because Seiko made them in much smaller quantities and in fewer variations. While the first 7T34 model made was named the SEH001P, its final model was perhaps the SEH095P. There was never an “SEHA” prefix for the 7T34 because Seiko didn’t make many variations based on the 7T34. By contrast, the 7T32’s inaugural model had the prefix “SDW” and finally ended with “SDWG” (there was never an “SDWH”). When Seiko stopped making the 7T32 caliber, it was replaced by the 7T62 caliber which bears the model prefix “SNA”. The 7T62 is a simplified version of the 7T32 with less one push button and one crown deleted; possibly for cost savings. Alas, the 7T34 had no successor as it wasn’t selling very well. I guess more consumers preferred the traditional date display instead of a tiny hand pointing at even tinier date numbers in a circle. I have three 7T32s myself at the time this caliber was still sold, but found only one retailer which had an SEH005P, which had an all-black dial and a black E6 rotating flight rule bezel. Although 7T34s are quite rare, they are not necessarily valuable in the collector market. I have a Seiko Automatic 6309-8099 815783, it has a brown dial w/ day & date and beveled crystal. I found this watch over 20 yrs ago while hiking in the mountains. I would like to know it’s date of manufacture and any other pertinent information you might be able to provide, expecially it’s value as I am considering selling it. Interesting site you have here, I never knew there were so many watch enthusiasts out there. Do you research other watches as well? I have 5 old pocket watches I would like to find out about. Thanks for your help! 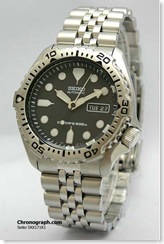 The old Seiko 6309-8099 which you’ve found is a U.S. export model. It’s made in Japan back in January 1978. The faceted (beveled) crystal was a trend throughout the 1970s and Seiko didn’t make faceted crystal watches until a brief revival with their Japan market, Spirit series in the mid 2000s. The 6309 is a robust workhorse movement but was considered an economical caliber. It has 17 jewels, was assembled by Seiko’s Suwa factory in Japan and neither hacks nor hand winds (fully automatic). It was one of the numerous styles which Seiko made in the 70s and your model has no particular historical significance, except that it’s “old school” and collectible to some people. The 7N83-0041 is a quartz ladies watch, styled after the Rolex Datejust for women. It has a classic look to it, fully Japan made. It probably dates back to August 1985. The third one (2P20-5809) is also a ladies’ dress model (U.S. version) and from the serial number it could be from March 1986 or 1996; but certainly no later than either year. Without pictures of the actual 2P20 it’s difficult to estimate the exact year as I don’t keep track of Seiko ladies’ quartz watches or their production history. I just wrote you and then realized I had 2 other Seiko’s to ask about: Seiko Quartz 2P20-5809 with RO in a box, serial #630598 and Seiko Quartz 7N83-0041 with A4 in a box, serial #584618. Thanks again for all that you do! Thanks for posting your question. The Seiko ladies’ watch that belonged to your grandmother is a Caliber 11A hand-winding (not automatic) dress model. It is a real Seiko because back then nobody made counterfeit Seiko watches. My mother has a Caliber 11A watch too, in running condition except that its original bracelet broke and there are no more replacement parts for it. Your mom’s watch was made by Seiko’s Daini factory on October 1972, which makes it almost 40 years old today. There’s an interesting article on the Caliber 11A which you can find here. Unfortunately Seiko women’s watches are not considered as collectible items; therefore they generally fetch less than USD100 on eBay. I have a Lassalle 5042-5049 S/N 500031. I got it in early 80’s so I suppose that is when it was made. It is Gold finish, with stainless back. I am assuming it would be gold plated not solid gold in any way (maybe they put a stailess back for durability – or would a sold gold have gold back as well? I know it was fairly expensive, so I am curious about it. 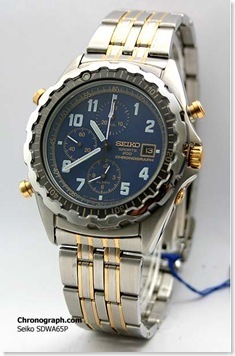 I think you made a typo and meant to say 5420-5049, because there Seiko made no such caliber as “5042”. The 5420 is a ladies’ quartz movement and yours was manufactured on October 1985, therefore you can’t possibly have gotten it in the early 1980s. Furthermore, Seiko acquired the Jean Lassale company’s watchmaking business only in 1982. Seiko 14K gold watches would have its caseback also made from gold; therefore since yours is merely gold plated, it is common for Seiko to use non-plated stainless steel backs. To my best knowledge, Seiko has never made gold plated S/S casebacks for its gold coated models. Congrats on your purchase of the Seiko Black Monster.  Your watch is from the “second generation” batch with an all-polished rear caseback and the cryptic “KG” initials (the early batches have no “KG” lettering and a matte, raised Tsunami logo at the center). It’s common for grey market Monsters (or any parallel import Seikos) to come in plain boxes as the original Seiko gift box is generally issued through authorized Seiko dealers. I’m quite certain yours is 100% authentic. It’s from December 2011 with the latest 7s26C movement, in case you’re curious. The Monster’s bracelet is said to be one of the trickiest Seiko bracelets to size due to the use of pins and collars but it can be done by an experienced jeweler. Reto Castellazzi has written an excellent tutorial on how to size the Monster’s bracelet, which you can find here. If you intend to have a watch retailer size the bracelet, print the page and let him follow the instructions. Hi I’ve just found my granpa’s watch and it would be awesome if i had more info on it. Thanks in advance for your help the s/n and model number is below. 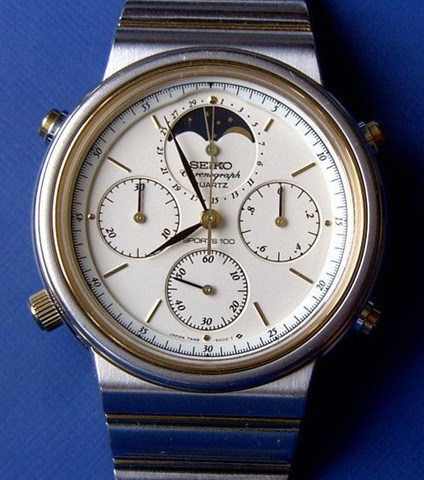 Your grandfather’s Seiko watch is very likely to have been made on December 1988. While I can’t find references to the exact model (5Y23-7000), I have very few photos of other 5Y23 models. They’re mostly from the 1980s judging from the styling and they’re all manufactured in Japan. There’s not much to say about the 5Y23 caliber; it was a simple day/date quartz movement with one jewel. It requires a Seiko/Maxell SR920SW silver oxide cell or an Energizer #391 equivalent. Most 5Y23 Seikos were made as dress watches with a select few having sporty looks. There were no Seiko diver’s watch that was made from this movement. Hello,I have 2 Seiko Watches,but I don’t know if they are original or replica and can you also tell me the price if you know it.The first watch is Seiko 5,crystal,water resistant,and on the back it says ” 170319 KY Stainless Steel 7123-8510-P A1″. There were no incidences of fake 7123 Seiko watches that I know of. You have a rather unique Seiko 5 as it’s one of the very few Seiko 5 watches with a quartz movement. However, for your 7s26-3040 there is a small probability that yours might not be authentic (although I’m inclined to believe otherwise) unless I get to see actual photos of your watch. I’m afraid I don’t quite understand what you meant by “The second have a date but only the day” because all Seiko 7s26 automatic should have both a day AND date calendar. This is a terrific question. Unlike some Swiss manufacturers, Seiko never officially published a complete history of all of their watches and clocks that they produced. There were rumors circulating on watch forums that the company didn’t archive their legacy products properly and that many of their records were either “lost or missing”. You can however visit the Seiko Museum in Tokyo to find out more about Seiko’s rich history, but the watches and clocks that are displayed there are the milestone or technology groundbreaking watches and clocks; but not generic Seiko quartz or automatic watches from the past. Without assistance from Seiko Japan, the task of collating the entire history of Seiko quartz movements (and models) are usually left to Seiko enthusiasts. a) Collectors have more interest in them. b) Mechanical watches generally last longer than quartz and are easier to repair/overhaul. There are also exceptions to the rule. Seiko made fewer analog quartz movements in the early-to-mid 1970s compared to the 1980s and beyond, therefore it’s easier to keep track of them. Seiko all-digital watches are also collectible and there are websites that dedicate to early digital watches – not just from Seiko, but also from Citizen and Casio. High end quartz (HEQ) movements also have their place in some collectors’ hearts but there aren’t too many e.g., Seiko Lasalle aficionados around. Seiko also made quartz movements only for Seiko diver’s watches, e.g. the 7C43, 7C46 calibers. Since Seiko diver’s watches are very often discussed in forums, it’s easy to narrow down to the year that caliber was produced. As for your second question, Alba is a subsidiary of the Seiko Holdings Group and therefore Alba watches can be dated using the same method as Seiko watches. The same goes for Pulsar and Lorus watches as they are also Seiko’s sub-brands. 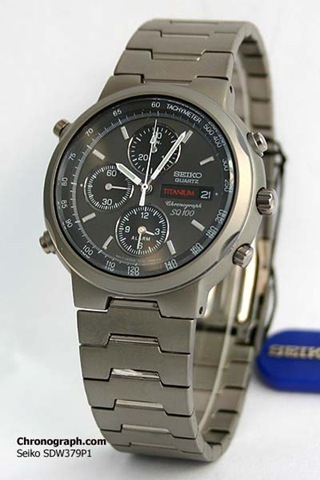 Citizen watches also follows Seiko’s numbering system; albeit their vintage models used 7 digits with the second two digits representing the month (“12” for December instead of “D”). Watch brands outside the Seiko Group that borrow Seiko’s movements have their own serial numbering system. For example, the French watch brand YEMA once used Seiko’s 4S15 automatic movement for the Yema “Seaspider” divers’ watches but they are not serialized in the same manner as Seiko. Orient Japan has also used Seiko’s quartz chronograph movements (like the 7T32 and 7T62) but they have their own serial number format. 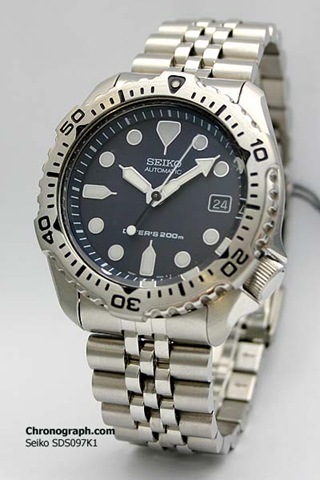 BTW, your Seiko 7N35 Scuba 200m is very likely to have been made on July 1994. If yours is the one with a blue dial and gold accented hands, that would be the model SBBC053. It is a JDM Seiko model. Hi, great site and lots of info. I have a Seiko watch I bought in 1971 when I was in Vietnam, the markings on the back are : 6106-6006, 178298 & japan j, has a SS back with “water resistant”. The face is black indicates a DX 25 jewel, has a window with day of week & day of month, is self winding. she still runs great today, any info would be greatly appreciated. Years ago my husband found a watch while he was demolishing an old building in Tasmania (Australia). We have been trying to find out what year it was made, could you please help. The whole watch glows after you hold it up to the light, so is it a uranium based watch? It is metal based I think and has the wind button at 3 o’clock. I wouldn’t know when your husband’s Lorus watch was made because you didn’t furnish the 6-digit serial numbers. The V515 movement was used exclusively for the Lorus brand and many of them were Disney’s Mickey Mouse watches. It appears that these watches were made in the 1990s. There are no watch manufacturers that use uranium to light up the phosphorescent compound in the dark. Radium was however originally used in coating the hands and dial numbers in the early 1930s and was subsequently banned twenty years later due to radium’s radioactive toxicity. The lume material that your watch uses is most probably LumiBrite, a proprietary compound from Seiko that is completely safe and non-radioactive. Also is there anyway of telling if it is gold plated or what carat gold it is? This watch is neither solid gold nor it is fully gold plated. It’s basically a stainless steel model with some gold accents on the bracelet links and gold toned hands and dial markers. Seiko watches with real gold will have the text “14K” or “18K” and “Gold” inscribed on the rear caseback. I have a watch which says Seiko, Water Resistant, Quartz on the white face. On the back: Eco Drive, Titanium (and a brass-colored globe). No model number, etc. The watch is titanium color (I guess) and has a clasp band. I couldn’t find any mention of a Seiko Eco Drive. Thank you for posting so much information. You have rather odd situation. The “Eco Drive” is a registered trademark of the Citizen Watch company and no other watch manufacturer can use that name. 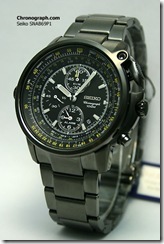 As such, there is no such thing as a “Seiko Eco Drive”. I suspect that somebody had lost your Seiko watch’s original caseback and substituted it with that from a Citizen Eco Drive watch, which happens to fit perfectly. I’ll need to see actual photos of your watch and you can upload them to Tinypic.com and reply to this post with the link to your watch photos. I have a ladies Seiko watch.The numbers on the back are as follows: 1N2986 and 1520 3339.This watch has not been worn often,still in the case and outside box.Can you please tell me when it was made? I own a women’s Seiko quartz “Sports 100” watch, 2A23-0279 [A4]. The serial number number is 590879. Based on the excellent information on your Web-site, I assume that my watch was produced in September 1985. The face of the watch is a very dark-gray with white time markings, white hands, and a red second hand. It shows day/date, and reads “Seiko Quartz,” “SQ Sports 100,” and “Japan 2A23 // 0490” in very small lettering along the bottom. The watch has a thin red bezel and the stem is located at 4:00 versus the usual 3:00. The band is bracelet-type in the very dark-gray color. I haven’t been able to find any information about my watch or find any similar photographs due to the colors (dark gray and red). Any information that you can provide about my watch would be very much appreciated. Thanks for the question. The 2A23 was a 1980s quartz movement for ladies’ models and Sept 1985 as its production date sounds about right. I don’t have any photos of your model and if you are unable to Google for the 2A23-0279, neither can I.
I can however tell you that your watch was made for the North American market and the detailed (and verbose) description of materials used is typical of U.S. Seiko models. The 2A23 caliber is a simple 2-jeweled, quartz movement with a date display. It requires a Seiko/Maxell SR621SW or Energizer #364 with a battery life rated for 2.5 years. Like most 80s Seiko quartz watches, the movement has a trimmer capacitor for the Seiko technician to make very fine accuracy adjustments. When your next battery replacement comes, you might want to have the rubber gasket replaced and the movement geartrain re-oiled if you haven’t done so already. I wish I could tell you more, but unfortunately that’s all I know about this watch caliber.